HERE’S WHY SEARCH IS THE GREAT CULTURAL EQUALIZER. Search engine optimization (SEO) and search engine marketing (SEM) help you show up when it matters most: when potential Chinese customers are searching for your products or services. No matter the language of your audience, they want to find you online quickly and easily. Maximize your search engine presence with SEO and pay-per-click advertising (SEM). Chinese SEO + SEM are very different than their English cousins, and require an advanced skill set. Because of Google’s limited presence in China, 70% of all local searches are done on Baidu, the leading Chinese search engine, as well as other China-specific search engines including Sogou and Haosou. 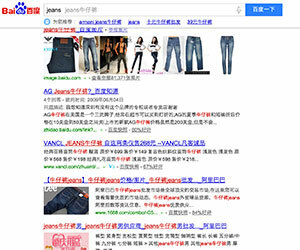 We can also optimize your products for shopping sites such as Taobao Tmall, JD.com, or Amazon China. If your target market is Chinese, but located outside of China, we will optimize your SEO and SEM campaigns for local customers searching with Chinese language browser settings in Google and Bing. WHY USE SHENG LI TO BOOST YOUR CHINESE SEO AND SEM EFFORTS? Familiarity: Far beyond simple translation, Chinese keyword research requires listening, analysis, and cultural understanding. As bilingual China natives, we have the knowledge and capacity to take this on. Research Capability: The search behaviors of Chinese speakers living internationally differ across the regions. Most of them use mixed search engines. We’ll customize your strategy based on research into your target audience and their demographic preferences. Precision: We customize SEO and pay-per-click tactics (SEM) for each platform, and optimize your site with select Chinese keywords to help you gain top rankings. Check out our Baidu advertising guide.